Dean Alexander Spanos (born May 26, 1950) is the team president and CEO of the National Football League's San Diego Chargers franchise, in which his father, owner Alex Spanos, purchased majority interest in 1984. Raised in Stockton, California, the son of Alex Spanos, Spanos earned varsity letters in football and golf at Lincoln High School (Stockton, California). Dean received the Lincoln High Hall of Fame Award, which honors alumni whose contributions and accomplishments are representative of the school. He continued his golfing career at the University of the Pacific, graduating in 1972. He was named President/CEO of the Chargers early in 1994. That same year San Diego’s team rose to the ranks of the NFL elite teams with its most memorable season in team history when it took the community of San Diego for a thrilling ride all the way to Super Bowl XXIX. 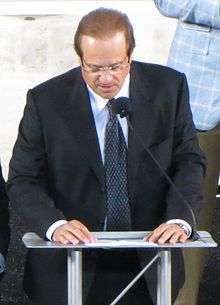 Under Spanos's watch as team president, the Chargers won 79 games during the last seven seasons (2004–10). That includes three playoff wins and five AFC West titles (2004, 2006–09). Spanos has received a number of awards, including the Harold Leventhal Community Service Award, the top award of the Huntington's Disease Society of America, which was presented to Spanos and wife Susie in 2011 by the national board for their generosity. He was inducted into the DeMolay International Alumni Hall of Fame in 2002. DeMolay International is an organization dedicated to preparing young men to lead successful and productive lives. In 2001, the San Diego Hall of Champions Sports Museum presented Dean and his wife with the Community Champions Award. ↑ Dean and Susie Spanos article Giving Back. gbsan.com. Retrieved on July 11, 2016. ↑ Dean A. Spanos profile, demolay.org; accessed September 24, 2016. Biodata, chargers.com; accessed September 24, 2016.